Through the project "Supporting Moldova’s National Climate Change Adaptation Planning Process", Viorel Neaga, the Director of a Business Incubator in Sîngerei town, Northern Moldova, has been able to implement the pilot project "Renewable energy for entrepreneurship", which supports the use of modern technologies for renewable electricity production as a way of adaptating to climate change, since this promotes consumer autonomy, supply stability and medium-term economic profit. The project is funded by the Austrian Ministry of Environment via the Austrian Development Agency and, with support from UNDP Moldova, is being implemented by the Ministry of Environment's Climate Change Office. Mr. Neaga’s Business Incubator received a grant to purchase and mount 54 photovoltaic solar panels with a total power of approximately 13 kW, in order to increase energy independence and promote distributed energy production to the 17 businesses within the Sîngerei Business Incubator. The peasant farm "Ocara Stefan Dumitru" also benefited from a grant to purchase and install 54 photovoltaic solar panels with a total power of approximately 10.5 kW. The electricity produced by photovoltaic solar panels will be used both for refrigeration system, where fruits and gooseberries will be preserved, and to pump water in the water tank located in the garden. The recipients of these grants have increased their energy independence, and reduced their annual electricity consumption by 35-40%. 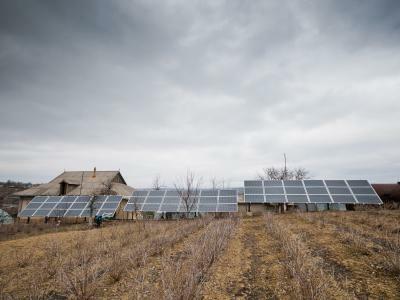 By installing solar panels and switching to a renewable energy source, the project beneficiaries are increasing efficiency and reducing their vulnerability, particularly in rural areas of Moldova. Following the successful implementation of these pilot projects in the energy sector, local producers are motivated to make plans for the future, applying technologies that contribute to adaptation and at the same time, that increase energy security and improve the welfare of the rural population. These pilot projects are lighting the way for climate-resilient energy in Moldova, and showcasing how stable energy production and delivery can be achieved through a variety of measures. Reducing annual electricity consumption by 35-40%. Read the UNDP summary "Lighting the way for climate-resilient energy in Moldova"